There is nothing quite like the brilliantly smooth shine of a brand new car. You look after your vehicle, wash it, maybe wax it when you remember, but that glossy newness starts to fade and wear. UV radiation, chips, stains, swirl marks, bird droppings, dirt, all of these take their toll. Which is where ceramic coating for cars comes in; ceramic car coating is a liquid polymer which creates a layer of protection over your vehicle’s paint job. The clear coat bonds with its substrate at the nanomolecular level, meaning it does not wash away or break down like a wax which requires re-application every few months. Ceramic coating for cars keeps your vehicle cleaner and looking its best for longer. In this article we look at automotive clear coat refinish and the different products available in the US. A ceramic coating for cars will protect the shine and gloss of your car’s clear coat. Is hydrophobic – they repel water, meaning water will bead on the surface and slide off. Mud and grime will also find it more difficult to adhere to the surface, and the car can be more easily washed, less often. Protects from chemical stains – acidic fluids and salt will stain and etch a paint job, but with a ceramic coating the hydrophobic property will prevent these destructive elements from affecting the paint. Enhances gloss – a ceramic coating coats your car in a slick, self-cleaning surface which makes your car glossy and shiny, like it just came out of the shop. Provides UV protection – when your vehicle is exposed to the sun, the paint will begin to oxidize and fade. A ceramic car coating provides a barrier which protects from this effect. If you take your vehicle into a shop for a professionally-applied ceramic coating, it will of course be more expensive than if you had applied it at home. 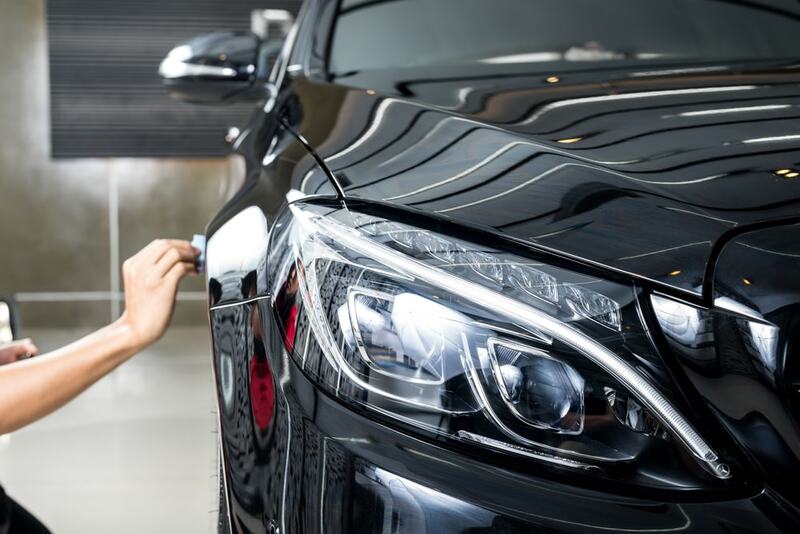 You are paying for the work hours, but also the security of a trained and experienced professional who will apply the best ceramic coating for cars available. An automotive clear coat refinish would be an investment for the serious car lover. Where waxing is a quarterly expense, ceramic coating is a one-off (though it requires reapplication to maintain the strength of the protection). A professional ceramic detail costs in the range of $1000 -$1500. Applying a ceramic coating on cars is an intensive operation, and many of these coatings require an experienced and qualified professional to apply them. The process is delicate and hiring an authorized detailer will mean a better and more effective coating application. There are, however, ceramic coating kits available which can be applied at home, if you wish to do so. Be aware that when applied at home, a flawless result cannot be guaranteed; ceramic car coating requires an absolutely contaminant free environment which can rarely be achieved in a private garage. After washing and buffing the car, wipe it down again with a low percentage (15%) IPA solution and a microfiber cloth, to make sure there is as little contaminants and oils as possible left on the car surface. Using a circular or back and forth motion, wipe the coating onto a panel, applying on one panel at a time. After 5 minutes, check the application for irregularities or high points. If they are present, gently wipe over the surface with a microfiber cloth to smooth out the surface. Here below you can find a selection of ceramic car coating products accompanied by price indications. If you would like more information about ceramic coating for cars, products, or would like to find an installer, please contact us! Note that some products may be available in different sizes and that 1 oz bottle is enough for applying multiple coats on a basic sedan. The durability of these products also varies, from 1 year to 5. Ohh! that the reason why the USA cars are having so shine on the body than other countries. These are the technique what they do it. Nice I think other countries should start this. As from my point of view some brands only do this, right? As everyone cannot afford this much. Thanks for the article.